The above 3" square lattice patio privacy screen is quite unique in its design. The cap rail is actually hand bent over the trellis. 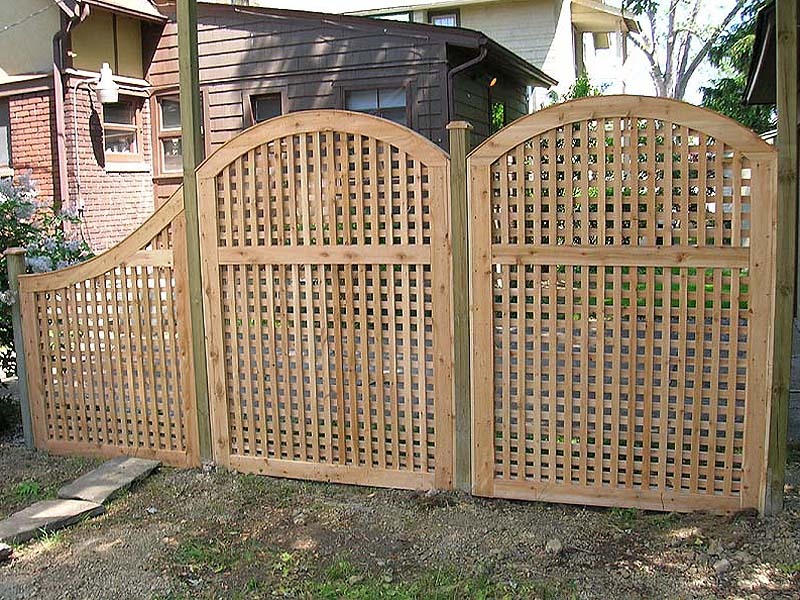 All of our lattice fences and trellises are custom, and can be built in any height. The lattice fence design on this page is 6' tall. The wood square lattice and framework are constructed of Northern White Cedar wood, and the posts are treated MicroPro posts with white cedar wood beveled caps. The size of the square is completely flexible. This panel may also be built with diagonal lattice instead of square. As with our square lattice fence, the diagonal lattice is custom made and hand crafted in our shop out of northern white cedar. We are happy to make it larger or smaller depending on our client's needs.